As home of the Gurdwara Panja Sahib, one of the most sacred sites in Sikhism, Hasan Abdal is an important pilgrimage destination. The city is also notable for its association with the 16th century Mughal Emperor Akbar - several monuments in the town date to the Akbar period, including the Mughal Gardens of Wah, Hakimon ka Maqbara, and Tomb of Lala Rukh. Hasan Abdal is also near the city of Taxila – a UNESCO World Heritage Site famous for its Buddhist and ancient Greek ruins. Hasan Abdal is located in a strategic part of northern Punjab, and was the location from which Mughal war expeditions were sent to the northwestern frontier. In modern times, Hasan Abdal lies at the intersection of the Karakoram Highway, and the M1 Motorway. As part of the multibillion-dollar China-Pakistan Economic Corridor (CPEC), the Hasan Abdal area will serve as the terminus for CPEC's Western Alignment, while the Hakla–Dera Ismail Khan Motorway will commence at Hasan Abdal. Hasan Abdal's Hakimon ka Maqbara was built in 1589. The Tomb of Lala Rukh was built in the 17th century, and is traditionally believed to be the tomb of a daughter of the Emperor Akbar. The famous Chinese traveler Xuanzang who visited the place in the 7th century A.D. mentions the sacred spring of Elapatra about 70 li to the northwest of Taxila which has been identified as the spring at of Gurdwara Panja Sahib. The town is mentioned in Ain-i-Akbari in the context that Shams al-Din built himself a vault there in which lies Hakim Abu’l Fath buried. Akbar’s visit to the town on his way back from Kashmir is also mentioned. William Finch who travelled through India between 1608 and 1611 describes Hasan Abdal to be a "pleasant town with a small river and many fair tanks in which are many fishes with golden rings in their noses ...; the water so clear that you may see a penny in the bottom". Raja Man Singh built the nearby Wah Gardens during the reign of Akbar. The terraced gardens were divided into four parts. Shah Jahan rested at Hasan Abdal's Wah Gardens on his four expeditions to Kabul. Emperor Aurangzeb stayed at the for over a year beginning in 1674, in order to quell the Afridi Revolt. The presence of Emperor Aurangzeb at the gardens convinced many local Pashtun tribes to abandon the rebellion, and join forces with the Mughals. "The Muslim version of the story is that one Hasan, a Gujjar, had many buffaloes; that a Faqir named Abdal came and asked him for a draught of milk. Hasan said, I would gladly give you some, but my buffaloes are at present dry. Abdal laid his hand on one of them and said, "Now milk it." He did so, and soon gave him a copious draught. Abdal expressed his gratitude to Hasan, and asked what he could do for him. Hasan replied that they were much straitened for want of water, on which Abdal struck the neighbouring hills in two places, from which the two streams of Hasan Abdal have come forth. On the departure of the Faqir, Hasan said the spot should hereafter be called after them jointly". 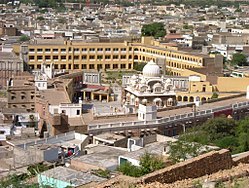 In 1521 the founder of the Sikh faith, Guru Nanak, arrived in Hasan Abdal, a Gurdwara was built on the spot that he stayed containing a sacred rock that is believed to contain the hand print of Guru Nanak. Punja or panja (Punjabi: پنجہ (Shahmukhi); ਪੰਜਾ (Gurmukhi)) :hand or paw. There are different traditions about the origin of the Hand print. 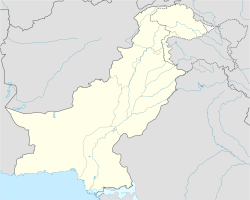 Hasan Abdal is located near the intersection of the Karakoram Highway heading northwest, and the M1 Motorway that connects Hassan Abdal to points northwest and southeast. As part of the multibillion-dollar China–Pakistan Economic Corridor (CPEC), the Karakoram Highway will be rebuilt, while the Hasan Abdal area will serve as the terminus for CPEC's Western Alignment. From the nearby village of Hakla, the Hakla–Dera Ismail Khan Motorway will run southwest out of the city and link Hassan Abdal to Dera Ismail Khan in Khyber Pakhtunkhwa province. There is a Tehsil Headquarters Hospital and numerous privately owned clinics in and around the city. Despite the exponential growth in population, the health care facilities are extremely insufficient. Many hospitals are located nearby Wah Cantonment or in Rawalpindi. The city has several state owned primary schools, a high school each for boys and girls, a higher secondary school each for boys and girls and a degree college for women. There are a number of privately run schools to make up for the shortfall of the state owned ones.presentation convent high school is also established since 1956. Cadet College Hasan Abdal is the first Cadet College in Pakistan and was established by the government of Punjab at the initiative of General Muhammad Ayub Khan, the then Commander-in-Chief of the Pakistan Army, originally to serve as a feeder institution to the Services Academies. For this purpose, Military Wings were started in 1952 in Government College, Sahiwal, and Islamia College, Peshawar. On the completion of buildings at the present location, the Military Wings were shifted to Hasan Abdal and the Cadet College started functioning as Punjab Cadet College in April 1954. In 1960, the government constituted a Board of Governors to exercise administrative control over the college. Hugh Catchpole was the founder Principal of the College. The college is located on the Rawalpindi/Peshawar road about 29 miles (48 km) from Rawalpindi/Islamabad, in natural surroundings near the junction of the National Highway and Grand Trunk Road. Surrounded by the fresh water springs with crystal clear water and Loquat orchards the city used to be an idyllic place till recent past. Its beauty as mentioned in the earliest accounts has somehow survived the ill planning that has resulted in an exponential increase in its population. ^ "Hassan Abdal". Hassan Abdal. Retrieved 2018-09-06. ^ a b c d Moon, Farzana (2015). The Moghul Saint of Insanity. Cambridge Scholars Publishing. ISBN 9781443883429. Retrieved 2 June 2017. ^ a b "China to finance 90% of Sukkur-Multan Motorway". Daily Times. 12 May 2016. Retrieved 13 May 2016. ^ Prasad, Ram Chandra (1980). Early English Travellers in India: A Study in the Travel Literature of the Elizabethan and Jacobean Periods with Particular Reference to India. Motilal Banarsidass. ISBN 9788120824652. Retrieved 2 June 2017. ^ Asher, Catherine Blansha (1992). Architecture of Mughal India, Part 1, Volume 4. Cambridge University Press. ISBN 9780521267281. Retrieved 2 June 2017. ^ Gandhi, Surjit Singh (2007). History of Sikh Gurus Retold: 1606-1708 C.E. Atlantic Publishers & Dist. ISBN 9788126908585. Retrieved 2 June 2017. ^ "The Roads Beyond Lahore: The Wah Garden at Hasan Abdal". Mughal Gardens. Retrieved 2 June 2017. Wikimedia Commons has media related to Hasan Abdal.